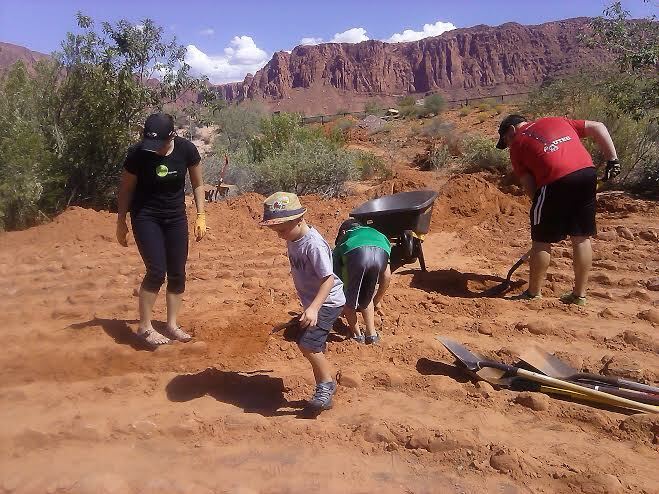 IVINS — With Bob Marley’s “Three Little Birds” playing against a backdrop of red rocks, sagebrush and shimmering, desert heat, around 25 people shoveled out dirt Friday morning to uncover the labyrinth at Desert Rose Labyrinth Sculpture Garden in the Kayenta community of Ivins for a wedding ceremony to be held Saturday evening. 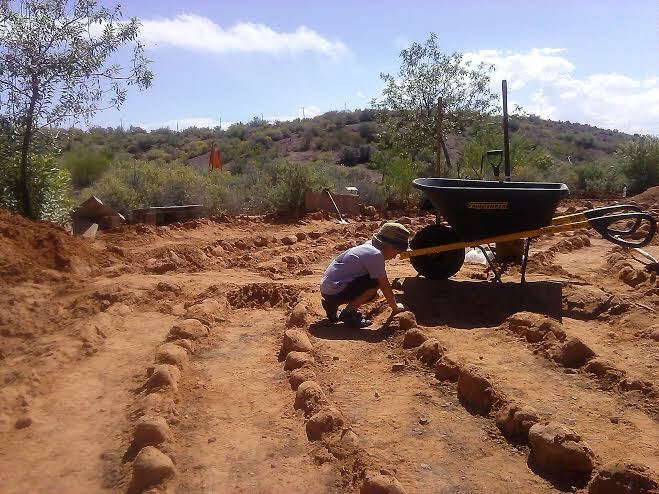 After visiting the labyrinth around three years ago, Draper resident Kendra soon-to-be Koehler said she discovered a spiritual, healing energy within Kayenta’s labyrinth — patterned as an eleven-circuit path defined by more than 1,800 indigenous rocks and designed after the 12th century Chartres Cathedral labyrinth in France. It was this magnetic energy that led her to choose this location for her wedding ceremony. 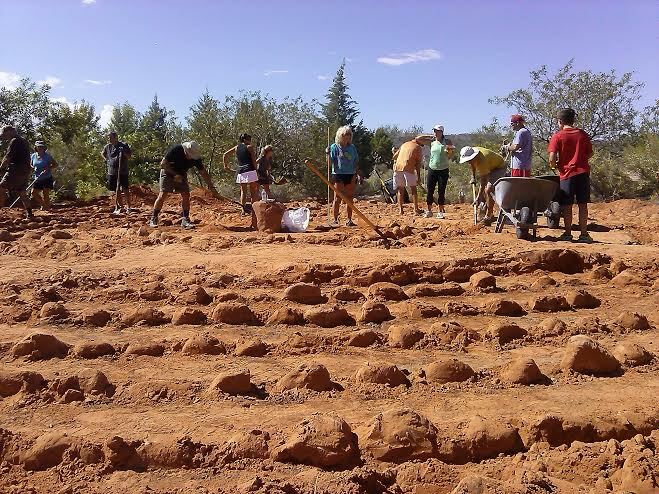 She and her fiancé, Matt Koehler arrived in Kayenta Wednesday evening to find that recent area flooding had coated the labyrinth in a thick layer of mud. 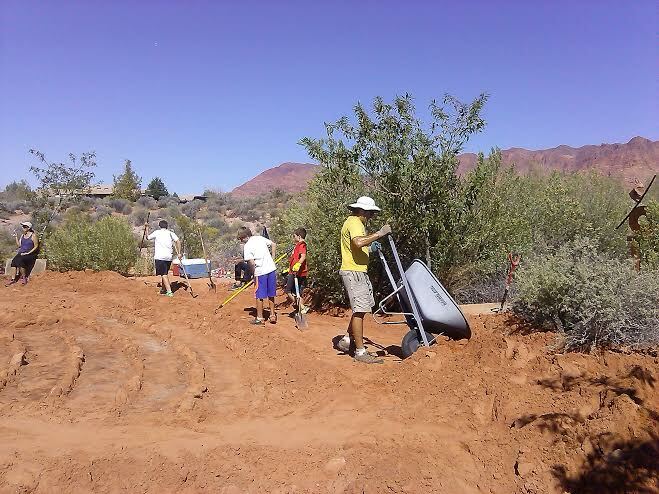 Shortly after, an email was sent to residents of Kayenta’s desert community calling for volunteers to help clear the labyrinth for the Koehlers. The turnout took everyone by surprise. Kristen Hunt and Tom Hunt, of Kayenta, had never before met the Kohlers but they heard about the need for help. By definition, a labyrinth is a singular, nonbranching path that leads to a center. It stems from Greek mythology and is found in numerous ancient societies including Native American, Mayan and Celtic cultures, as well as others. The practice of walking a labyrinth is defined in no certain terms and allows for an individual experience for purposes of healing, blessing or honoring life. Anthony Mickay, 10, of Draper, said that at first when he heard that they were going to have to go work he was disappointed. 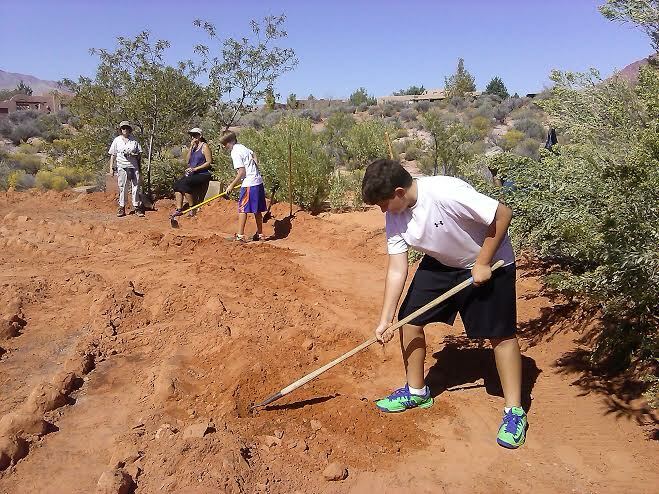 “The hardest part about doing this is when the mud is really hard it’s hard to move it,” Tate Simpson, 12, said. Simpson’s friend Sebastion Torres, 12, has never seen the labyrinth before. 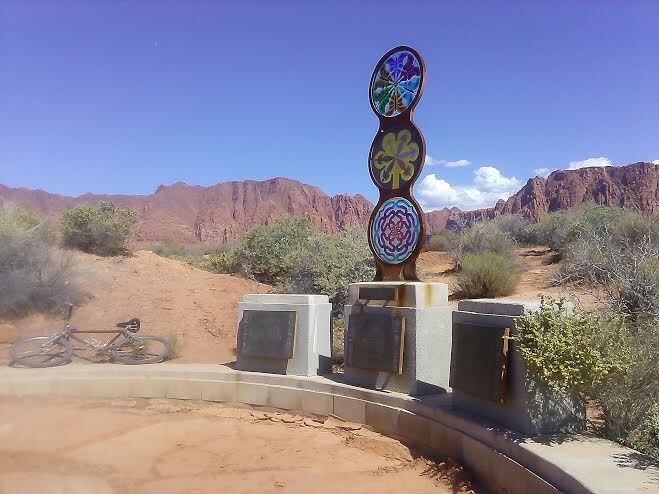 Corinne Van Meter said she and her husband visit the labyrinth often and have a bench dedicated to their daughter Vicki Van Meter, who died about six years ago, mounted near the labyrinth. Van Meter also did not know the bride and groom before this joint effort. The Koehlers’ original pre-wedding plan was to hold an “amazing race” that would include activities like paddle boarding and archery. The idea was to pull the families from both sides together. Ed. note: The bride-elect, Kendra, asked to be referred to as Kendra Koehler in anticipation of her Saturday wedding. Instead of Alter or Altar, use the word Neuter which best describes how guys are altered at the altar in southern Utah, especially when the bride at the altar is religiously mentally altered. KOOLAID, it sounds as if your personal choices have limited you to such a degree that you believe your past life experiences are applicable to all others. Back in reality, by projecting your own failures and personal disharmony on others only serves to distract you from working on your sense of worth and true purpose. I absolutely love the Desert Rose Labyrinth. I was hoping to make it out there in the next few days. I’m glad others love it as much as I do. Kudos to all the volunteers and families who put in such hard work! Thank you!